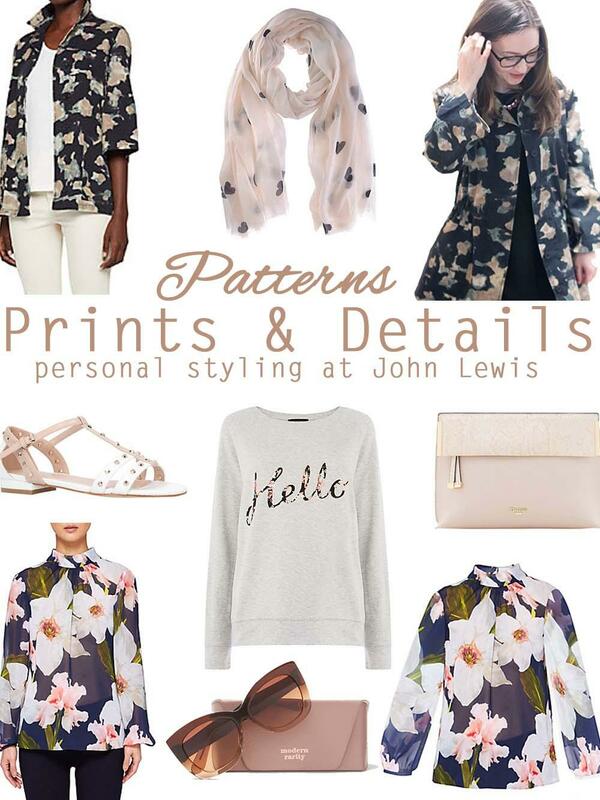 A few weeks ago the John Lewis store in Queensgate Shopping Centre, Peterborough hosted a relaxed evening of food, drinks and fashion. Two of their personal stylists Alison and Ian had carefully curated clothes rails full of their favourite items from across the brands available at John Lewis to showcase the key trends for Spring. It was a really inspiring evening in which I learned some clever tricks on how to best combine pieces and colours, got a chance to try on some killer outfits and learned more about what’s involved in a personal styling session. I thought I’d do a couple of mood boards based on my own favourite finds at the event. Roll on payday as I need to freshen up my wardrobe for Spring after a very dull Winter! 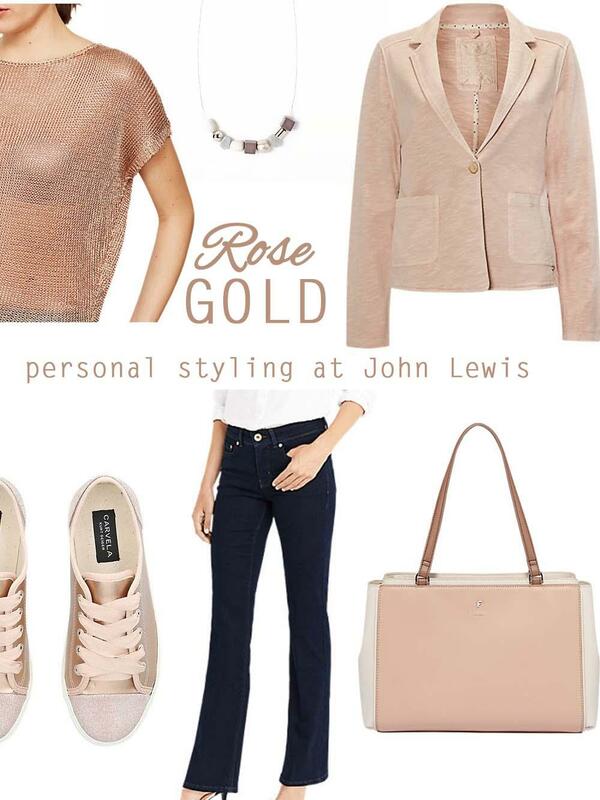 Metallics are going to be huge this spring and so of course I made a beeline for the rose gold items, of which there are many to choose from this season – hooray! For a chic take on the trend layer tonal colours together, or to create a funkier look don’t be afraid to clash and contrast different hues. Rose gold and silver look particularly striking. I fell head over heels for a mesh rose gold top from Mint Velvet (one of my favourite brands for their chic mix of neutrals and luxurious fabrics) which looks amazing paired with a fitted pink blazer, dark wash jeans and silver/gray accessories. Patterns – big and bold or subtle – anything goes! Patterns and detailing return in full bloom this Spring after a rather monotone Winter… it’s up to you how big or small you choose to wear them! The beautiful floaty shirt from Ted Baker is an exclusive print designed especially for John Lewis which everyone at the event adored. I think it looks even better worn so I’ve shown it both on and off the hanger. I tried on the utility camo jacket from French Connection and didn’t want to take it off again! As you can see it looks totally different on me as compared to the model on account of my short stature, but if you’re petite you can get away with it due to the three quarter length arms and an elasticated waistband which helps to give it a good silhouette. 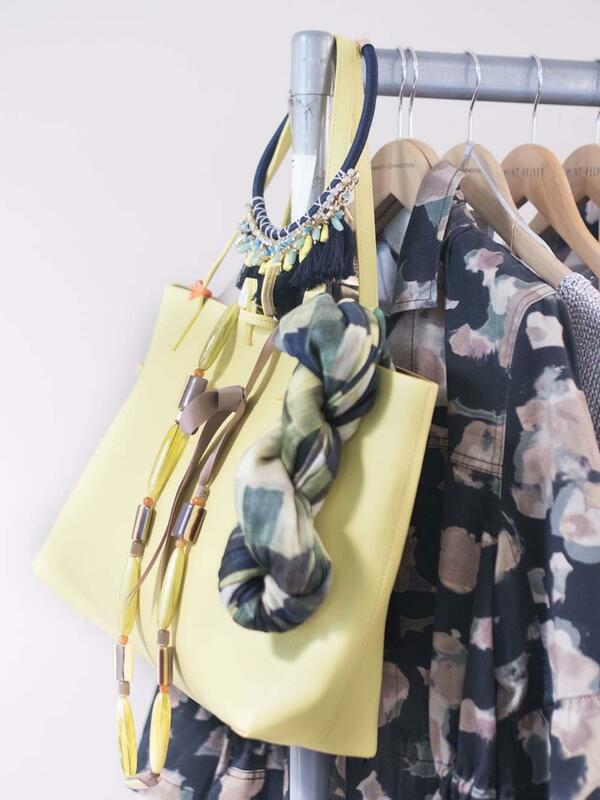 If you prefer a more understated look try freshening up your wardrobe by using pattern or embellishments on your accessories instead. A subtle snakeskin (faux of course) on your handbag, some stud detailing on your shoes, a light scarf or even some statement sunglasses all work well. I’ve always felt a bit too shy and introverted to use a personal styling service. I’m pear shaped and I dread the thought of being given clothes to try on and having to suffer the shame of telling the stylist that I couldn’t get anything past my hips. Plus I feel like I’d be a really difficult customer thanks to my height limitations. Speaking to Alison about the role of the John Lewis personal stylists helped to put these fears to bed. As she explained, it’s their job to know what will and won’t work on each individual and they are extensively trained in the most up to date techniques to find the right cuts of clothes to enhance, elongate, reduce or flatter certain aspects of a person’s figure. It’s not just about body shape though, a good personal stylist considers a wide variety of factors including age, skin tone, hair and eye colour and bone structure as well as the individuals personality in order to perfectly tailor the service to that person’s needs. Ian, one of the John Lewis personal stylists for men, explained that often it’s the little details that he helps his clients to get right, from choosing the right width of tie to perfectly complement the neckline on a collar or recommending the perfect cut of jeans. One of the outfits he had styled teamed a pink shirt with a navy blazer and it looked fantastic – he showed that pink can look great on men as well as women if used in the right way! It was great to meet the personal stylists and have a relaxed chat with them so I have to thank John Lewis, Peterborough for the lovely idea to host a blogger event. It’s given me the confidence to finally say yes to a personal styling session so watch this space for an update on how I get on! 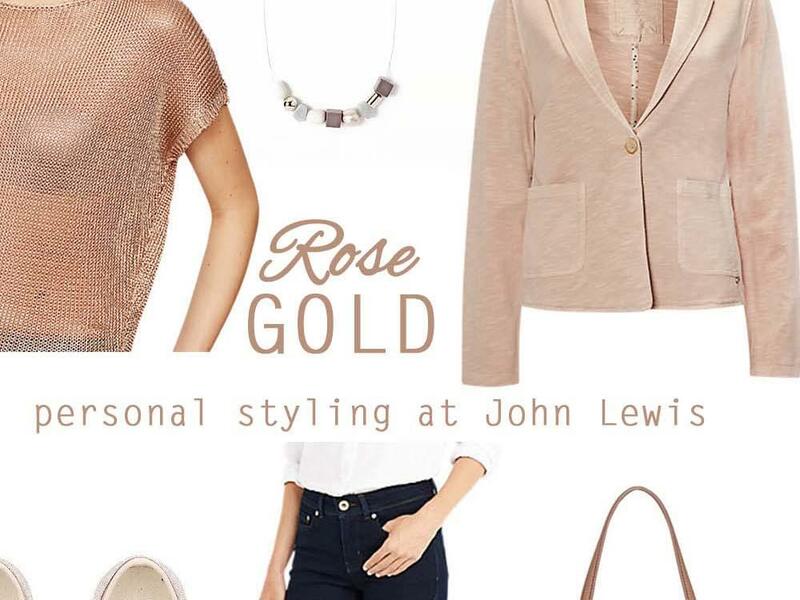 John Lewis offer a 1 hour Style Express personal styling session (perfect for when you’re looking for that one special outfit) or a more comprehensive 2 hour Style Experience session where you have more time to explore ways to give your wardrobe a complete refresh. Both services are completely free and carried out by trained personal stylists, you just need to go online to book a session which you can do here. Disclaimer: The evening with John Lewis was a free event kindly put on for a group of local bloggers. There was no payment involved, I just fell in love with so many of the lovely pieces that they showed us that I wanted to share some of my brilliant finds with you!